iPhone alarm clocks are quite popular these days. I don’t know about you but I personally can’t get up early without an alarm clock. If you have taught your body to get up at a specific hour in the morning, then good for you. But for the rest of us, alarm clocks can be quite handy. iPhone alarm clocks are essentially docks that come with alarm capability and allow you to save money and use your phone or iPod as your clock. 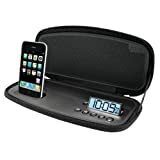 iHome Portable Stereo Alarm Clock for iPhone/iPod: a super portable charging dock and clock for iPhone. Runs on battery and AC, so you never miss out. iLuv iMM173 Alarm Clock and Dual Dock: talk about hitting multiple targets with one shot. Charges your iPhone and iPod. Lets you wake up to buzzer, your phone, or FM radio. 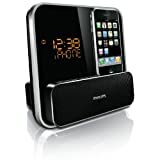 Philips DC315/37 Speaker System: a killer alarm clock system for iPhone. Has dual alarms with weekday and weekend settings. It also has a FM tuner. 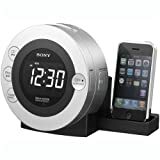 Sony ICFCD3iP CD Clock Radio for iPod and iPhone: an attractive clock system for iPhone that is compact and great for travel too. You can adjust the alarm volume for CD, iPod player, iPhone, or radio, which is a plus. 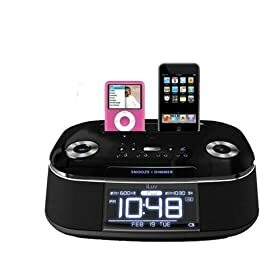 iHome Rotating Alarm Clock for iPhone and iPod: lets you wake and sleep to your iPhone/iPod content. Has great sound and charges your gadget as well.